These stories are a delight and perfect to share with young children beginning to read for themselves or as bedtime stories! Best friends Armadillo and Hare live in the Big Forest with an assortment of intriguing neighbours - among them an invisible stick insect, an acrobatic wombat and a know-it-all lobster. Hare loves to play the tuba and Armadillo has a passion for cheese sandwiches and they get along just fine - most of the time. In these ten stories Armadillo and Hare variously deal with a non-working fridge light; a slightly scary jaguar with big teeth looking for a meal (ingeniously provided with a cheese sandwich); a blustery storm in which Hare is terrified and elephant gets his head stuck in the window frame and a flood where their log cabin is carried away. One of the best stories is when hare tries to teach Armadillo to dance to no avail and then loyally stays by Armadillo’s side at a party even though he is longing to dance. But on their way home they pass a meadow full of flowers where hare plays his tuba and Armadillo begins to dance. There is such tenderness and generosity of friendship in this tale. The collection is a wonderful celebration of differences and friendship and finding the extraordinary in the ordinary. 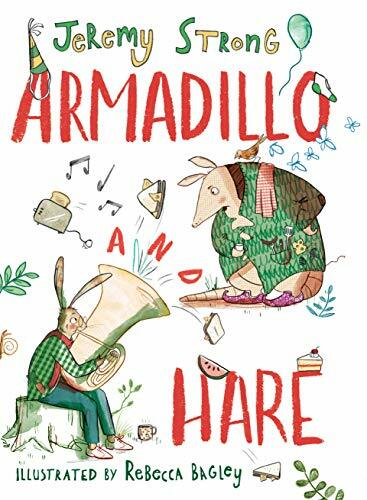 They way Armadillo and Hare look out for one another and help each other overcome their fears is beautifully portrayed along with the message that not everything has an answer or a ready solution. Expressive illustrations by newcomer Rebecca Bagley add to the package - hare’s ears are particularly eloquent.